The most frustrating part of our week stay--having to type A-L-B-U-Q-U-E-R-Q-U-E so many times performing our usual internet investigations of the area and foreseeable travel. Maybe the programming son can create another widget for me. Some people want to do museums...parks....monuments....zoos...WE DO LOCAL FOOD! 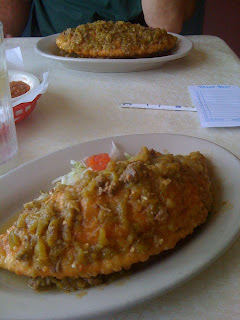 A sopapilla stuffed with marinated pork and cheese smothered with green chile from Mary and Titos in ghetto-town ABQ, where you find the best food and hope to find your vehicle when you return to the parking lot. They were huge, no way we could eat our own (hence the mirror in the background--(wink). I rated it 4 beads of sweat on a scale of 5. Double Eagle II, Albuquerque's (seriously, where is my widget) GA (non-commercial) airport sat 7 miles due north of our RV park. With a scanner listening to the control tower, relaxing as it gets for me. Teri clearly picking up my enthusiasm for aviation. We went up and hiked Boca Negra canyon and visited Petroglyph National Monument, one of three areas with ancient Indian drawings on volcanic rock, many almost a 1,000 years old. There is nothing more fun than trying to look up and climb steep terrain while at the same time looking down for rattlesnakes. Now you see why we like food sight-seeing. Someone packed her turista gear. Spending 22 years in Denver, just seems odd when you look EAST and see the mountain range soaring over Alb (u know the rest). You can seriously blame the Indians for today's graffiti problems. The secret to a 25+ yr marriage, reciprocating indulgences---my airports, her freaky food stores. Hey, the Sea Salt/Turbinado Sugar Dark Chocolate covered almonds were worth the shopper congestion on a Saturday! Oh look, another museum, historic landmark food joint! Route 66 Diner, splendid vanilla milk shakes with real whip cream. Doing their duty to keep cardiologists gainfully employed. Shocker, we did a real museum! Int'l. Ballon Museum north of town. Hey, it's aviation, what did you expect. The city plays host to 800,000 visitors each October, can't even fathom how this city fits them all in. We bid you farewell tomorrow Albuquerque and your demonic winds. We will point our rig to the west and see what Arizona has to offer. Someone mentioned something about a big hole in the terrain in the northern region of the state, we will let you know if there is any truth to it. You have me laughing with your blog posts! I think you are now my favorite RV blogger! We are currently in Santa Fe. See, we were smarter than you, I knew I didn't want to keep trying to type Alq.... in my blog, so we opted for Santa Fe. We didn't avoid the 30 something temps though. @Deb. Thanks. Let me know if you find any pelts that we can line the wife's flip flops with..don't mind the temps as much as I do the winds..safe travels! ALBAQUOIKIE is the preferred pronunciation among rabbits, but what do they know? Their idea of a diner is a garden patch. We're loving Ajo temps right now, and are venturing toward Sedona. I hope we don't travel in haste, repent in leisure. AND another thing...is your "follow" thingie operational?